The study analyses ﬁnancial cycles based on a global sample of 34 advanced and developing countries over the period 1960Q1 to 2015Q4. We use dynamic factor models and state-space techniques to estimate ﬁnancial cycles in credit, housing, bond and equity markets, as well as aggregate ﬁnancial cycles for each country in the sample using a large number of variables conveying price, quantity and risk characteristics of respective markets. 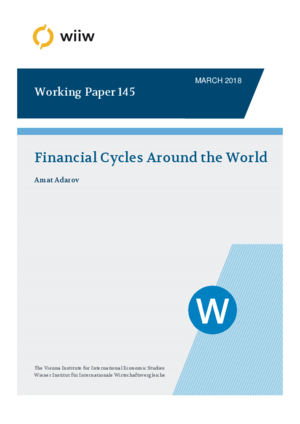 The analysis reveals the highly persistent and recurring nature of ﬁnancial cycles, which tend to ﬂuctuate at frequencies much lower than business cycles, 9‑15 years on average, and are indicative of major ﬁnancial distress episodes. Our results point to notable intra-regional synchronisation, as well as nontrivial co-movement tendencies between European, American and Asian ﬁnancial cycles. We also extract global and regional ﬁnancial cycles, the former closely associated with the dynamics of the US T-bill rate and the VIX index, conﬁrming the existence of common supranational factors governing the boom-bust dynamics of ﬁnancial market activity around the world.